Provisional booking held for 5 days if arrival day is at least 2 months from inquiry date. 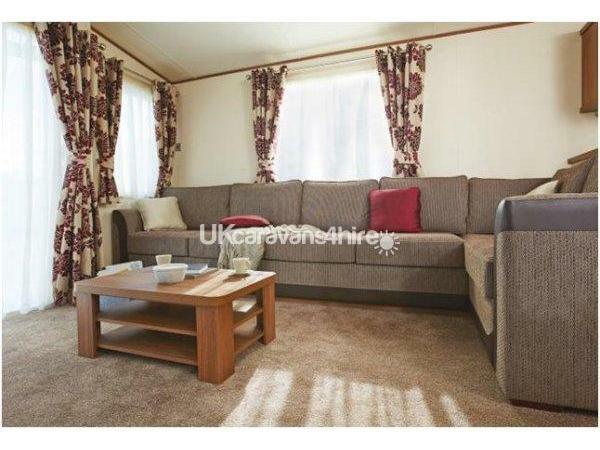 Initial Booking Fee of £75.00 refundable if caravan, furnishing and domestic equipment are not damaged and caravan keys returned. Not refundable on late cancelation. Full holiday letting fee refunded up to 3 weeks before arrival date or to the discretion of the owner. 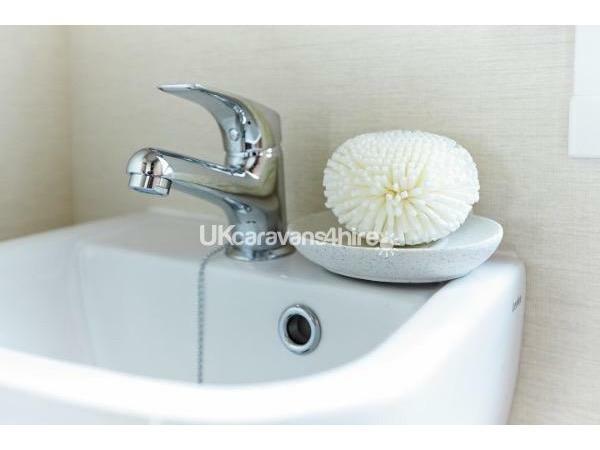 Full holiday letting payment required 6 weeks prior to arrival date. The WEB Site is constantly under reveiw. So please keep a close and up-to date view of it. 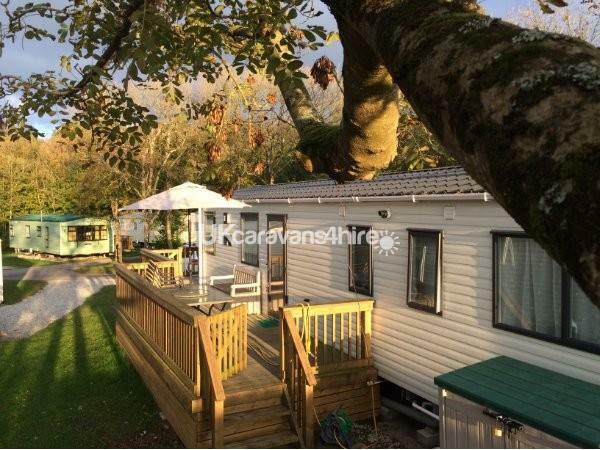 Caravan Address - 152 Hedgerow St Minver Parkdean. 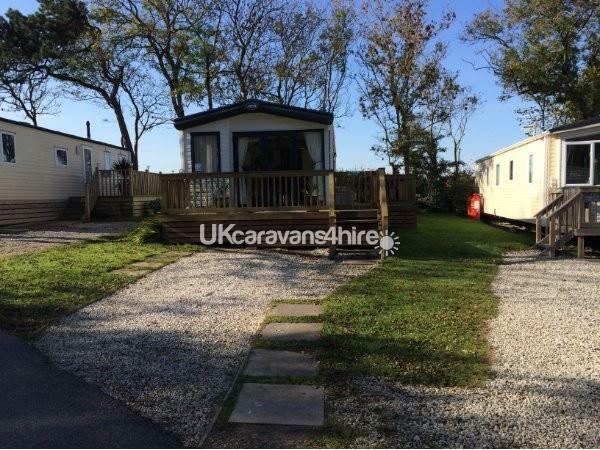 This Parkdean site has many privately owned holiday lets. 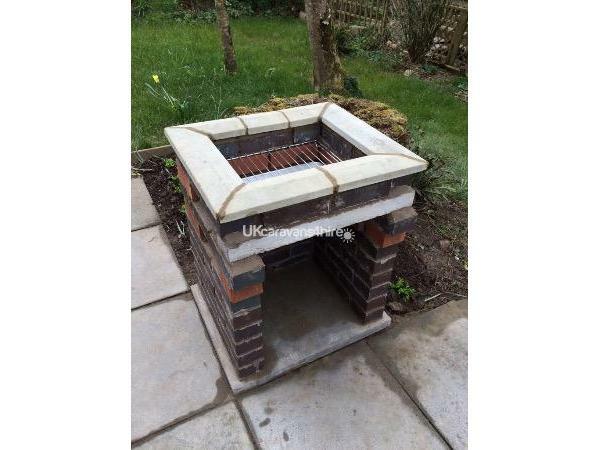 Each owner prides themselves with keeping their property and the whole site in a pleasing and pristine condition. 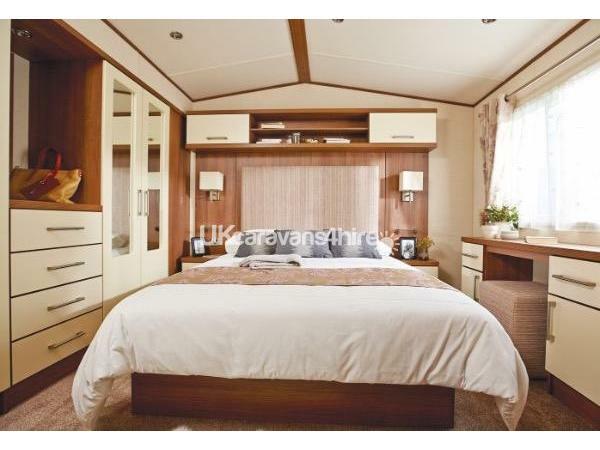 THE CARAVAN IS OF AN EXTREMELY HIGH STANDARD WITH REGARDS TO STRUCTURE, FIXTURES FITTINGS AND IT'S SURROUNDINGS. 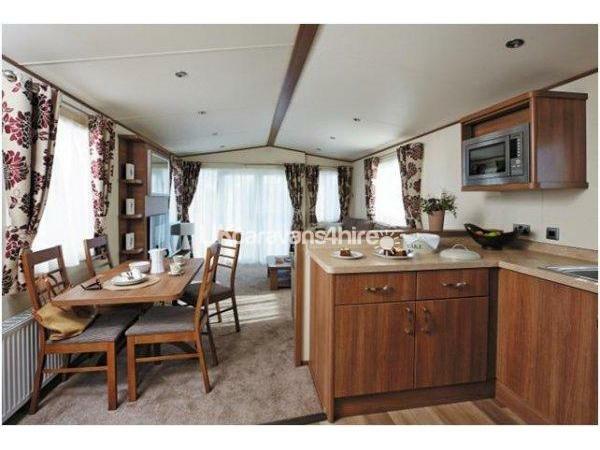 Our caravan was purchased for the 2015 season and has the benefit of a washer/dryer and dishwasher. Flat screen TV in both bedrooms and the open plan lounge. The Master bedroom has a king sized bed and an ensuite toilet /wash hand basin. 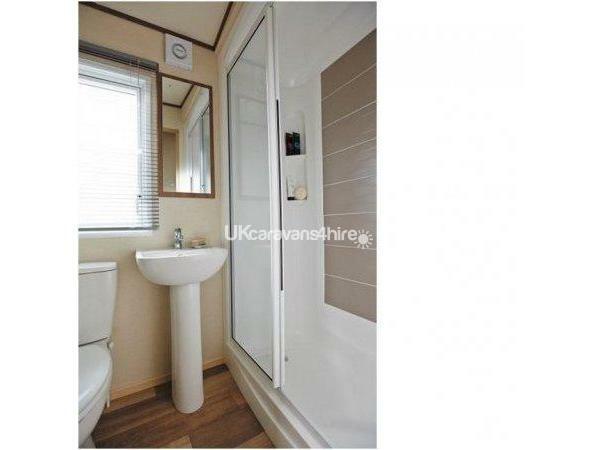 There is a separate shower room with power shower, toilet and wash hand basin. 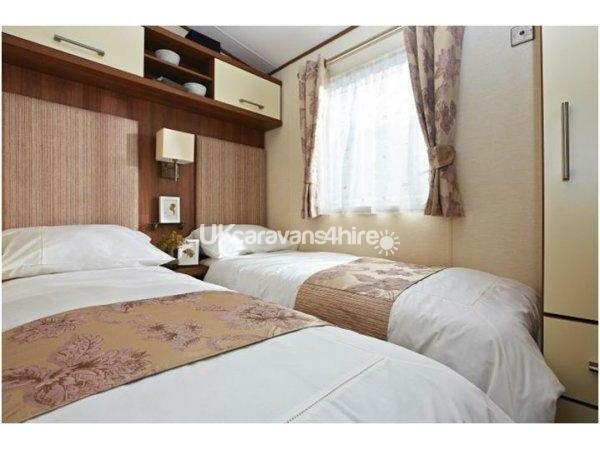 The second bedroom has twin beds, and there is a further pull-out double bed in the lounge. 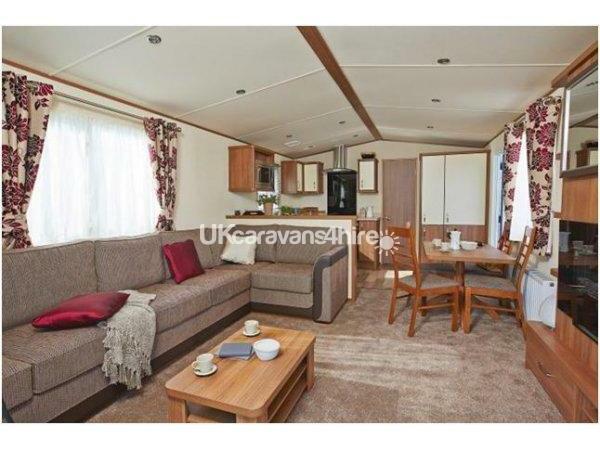 The open plan kitchen has a full sized fridge/freezer and microwave, alongside a dishwasher adding to the excellent facilities incorporated in this holiday home. 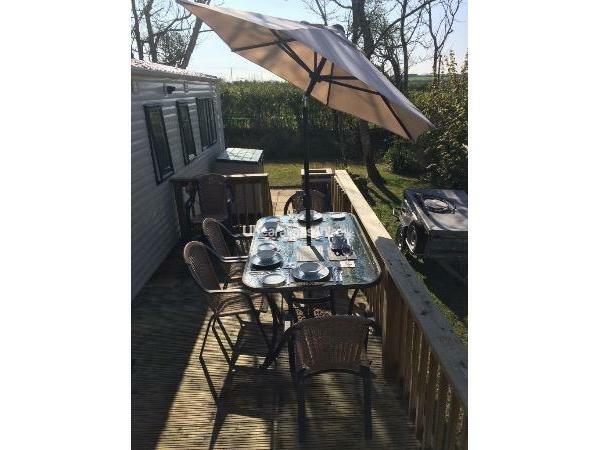 There is a separate dining table and chairs and open plan lounge including fitted lounge suite and full length patio doors opening out to the decking adding to the "wow" factor and ensuring a comfortable home from home stay at St Minver. The back garden has been set out for the enjoyment of late afternoon/evening relaxation - to catch the rays. If you fancy sitting outside there is a large decking patio area with table and 6 chairs. Parking area in front of the caravan. 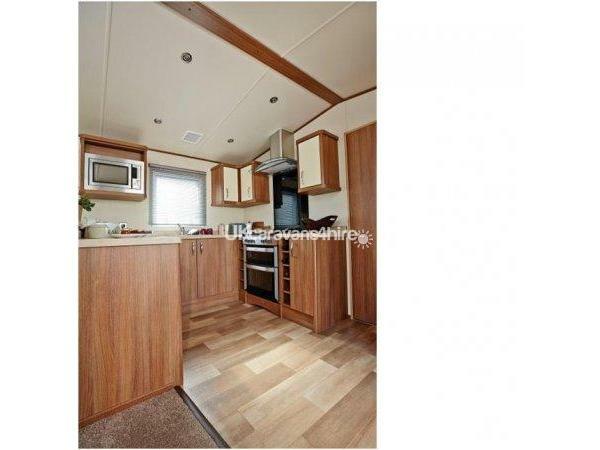 A boot / surf board storage bench seat sited by the main entrance to the caravan. For the young children there is a purpose built football facility, amongst many other amenities that are designed with safety in mind. In door swimming pool, nature trails, coffee lounge and restaurant are also on-site, with the club house providing entertainment on a regular basis. St Minver Holiday Park is a totally enclose area - accessed by one long driveway - so security for young children is extremely good. As you get to explore the areas nearby, you will be astonished with the variety of places to go, whether you cycle, walk or drive. St. Minver Holiday Park owned by Parkdean Holidays, is located 2 miles from Rock which lies on the Camel estuary with its beautiful beaches of Daymer Bay, Rock and Polzeath, known for its surfing. All beaches have car parks and Polzeath also offers surfing lessons along with surfing equipment to hire. St.Minver park benefits from lying in wonderful private grounds boasting a large indoor pool, sauna, indoor and outdoor seating area and full changing facilities. Also on the park is a laundry ,well stocked shop, children's play area, and crazy golf. Amenities at The Manor House include a Costa coffee lounge and free WiFi, restaurant, bar, takeaway food, amusement arcade and entertainment area providing a full and varied daily program for children and adults. The villages of of St.Minver & Pityme have local pubs providing food and occasional entertainment. On the road leading to Rock there are a variety of shops including two deli's, a Spar, fish shop, butchers and several takeaways, whilst in Rock there are several excellent cafes along and unforgettable seafood/traditional restaurants. In Rock you can learn to sail, water ski and windsurf. From Rock you can catch the ferry to Padstow, renowned as an old traditional fishing port and of course for the many restaurants of TV chef Rick Stein. Or visit nearby locations of Port Isaac (featured in the TV series Doc Martin) Port Quin, Tintagel and Boscastle. Further afield Eden Project is only 40 minutes away. Or visit the towns of Truro, Bodmin and St Ives. Rock is also a great place to start and walk along the sands and the many coastal paths with wonderful views out to sea and across the bay. Our closest town is Wadebridge which benefits from 3 supermarkets, a wide variety of shops, local leisure facilities and is the main base for the Camel trail that runs from Bodmin to Padstow. The trail can be walked or you can hire cycles for adults, children and even your pet! A real must to do. On arrival Check-in with Parkdean holiday park St.Minver main reception. PLEASE NOTE, that bed linen, towels and tea towels are not included. (Please bring your own. (duvets / pillows are provided). Gas and Electric is included EXCEPT March & October when charges MAYBE an added extra (£10/week)) This applies ONLY when EXTREME bad weather is encountered to cover extra heating bills. To date we have only charged once for this surcharge. Maximum persons staying is 4 unless there is also an infant under 2 yrs old.then we will accept 5 persons including the infant. In quieter months there is greater flexibility with the dates and length of stay ( ie Saturday to Wednesday - Wednesday to Saturday) Just ask Paul on 07771650013. If no booking prior to yours then an early arrival may be considered. BOOKING WEEKS ARE SATURDAY TO SATURDAY. Please note that there is a weekly charge for some Entertainment facilities, this includes the use of the swimming pool and any Live Entertainment in the club house. Currently the combined package is £12 per person. Please check these have not been increased since this information was published. The bar area is free and has no charge. NOTE:- PARKDEAN NO LONGER PROVIDE BEDDING and TOWELS SO BRING YOUR OWN. PLEASE CHECK WITH PARKDEAN WITH THE ABOVE PRICES AS THEY MAY CHANGE WITHOUT US BEING AWARE. Additional Info: Live Club Entertainment and Swimming Pool Access - £12/week/person (Check these prices with Parkdean) Nature Trail - Wildlife Nature Trail - Woodland Walk - Outdoor picnic area with seating - Multi-sports court (For football, basketball and netball) - Pool table, darts and table tennis - Indoor soft play area with ball pool.Outdoor adventure play area (With fun tower, wooden walkway and swings) - Little Lending Library - Showbar Entertainment Club with family shows and quiz nights - Pizza & Steakhouse Restaurant (With takeaway serving a choice of delicious meals plus Costa Coffee) - Outdoor picnic area with seating - Convenience store with off-licence Well stocked for all your daily essentials AND MUCH MORE.